When some of the world’s major nuclear powers meet in Washington DC next Friday, they will be shadowed by the rising terrorist attacks– largely in Europe, the Middle East and Africa. 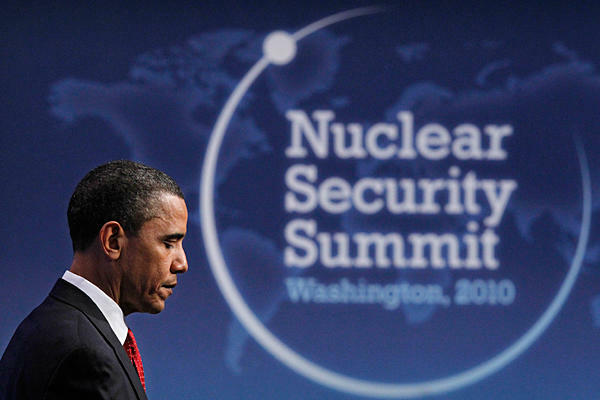 The 2016 Nuclear Security Summit, which will take place 31 March-April 1, will the fourth and final conference in a series initiated by US President Barack Obama in 2009 to address one key issue: nuclear terrorism as an extreme threat to global security. “As well as strengthening intelligence and transnational cooperation, I hope they won’t forget that the risks start with the nuclear weapons in the arsenals of the nine nuclear-armed states”. These nine include the five permanent members of the UN Security Council –the US, Britain, France, China and Russia –plus India, Pakistan, Israel and North Korea. Johnson said access to nuclear weapons and materials would be greatly reduced if governments would take bold steps to prohibit everyone from using and deploying nuclear weapons, along with activities like transporting warheads and nuclear materials. This is one of the initiatives being discussed in a UN Working Group in Geneva this year. Dr M.V. Ramana, a physicist and lecturer at Princeton University’s Programme on Science and Global Security and the Nuclear Futures Laboratory, told IPS: “As the last nuclear security summit during the Obama administration’s term, I hope that the summit will not be an exercise in futility. Unfortunately, I don’t think we should have any expectations of any dramatic breakthroughs”. To start with, he said, all the Security summits have been very narrowly focused on just civilian HEU (Highly Enriched Uranium). Occasionally there is some talk about plutonium, but this is more the exception than the rule. The real big stockpiles of fissile material are the military stockpiles of highly enriched uranium and weapon grade plutonium that are possessed by countries with nuclear weapons, and the large quantities of reactor grade plutonium accumulated by countries that reprocess their spent fuel, he pointed out.